Makara (Sanskrit: मकर) is a sea-creature in Hindu culture. It is generally depicted as half terrestrial animal in the frontal part (stag, deer or elephant) and half aquatic animal in the hind part (usually a fish or seal tail, snake tail though sometimes a peacock or even a floral tail is depicted). Even though Makara may take many different forms throughout Hindu culture, in today's modern world, its form is always related to the Marsh Crocodile or a Water Monitor. In Hindu astrology, Makara is equivalent to the sign of Capricorn, tenth of the twelve symbols of the Zodiac. Makara appears as the vahana (vehicle) of the river goddess Ganga, Narmada and of the sea god Varuna. Makara are considered guardians of gateways and thresholds, protecting throne rooms as well as entryways to temples; it is the most commonly recurring creature in Hindu and Buddhist temple iconography, and also frequently appears as a Gargoyle or as a spout attached to a natural spring. Makara-shaped earrings called Makarakundalas are sometimes worn by the Hindu gods, for example Shiva, the Destroyer, or the Preserver-god Vishnu, the Sun god Surya, and the Mother Goddess Chandi. Makara is also the insignia of the love god Kamadeva, who has no dedicated temples and is also known as Makaradhvaja, "one whose flag depicts a makara". Makara is a Sanskrit word which means "sea dragon" or "water-monster". It is the origin of the Hindi word for crocodile, मगर (magar), which has in turn been loaned into English as the name of the Mugger crocodile, the most common crocodile in India. Josef Friedrich Kohl of Würzburg University and several German scientists claimed that makara is based on dugong instead, based on his reading of Jain text of Sūryaprajñapti. The South Asian river dolphin may also have contributed to the image of the makara. In Tibetan it is called the "chu-srin", and also denotes a hybrid creature. 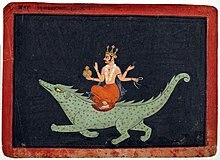 During the Vedic times when Indra was the God of heaven, Varuna (the Vedic water god) became the God of the seas and rode on makara, which was called "the water monster vehicle". Makara has been depicted typically as half mammal and half fish. In many temples, the depiction is in the form of half fish or seal with head of an elephant. It is also shown in an anthropomorphic (abstract form) with head and jaws of a crocodile, an elephant trunk with scales of fish and a peacock tail. Lakshmi sitting on a lotus is also a depiction in which she pulls the tongue of the elephant shaped makara is meant to project Lakshmi's image as the goddess of prosperity, wealth and well being. It represents a necessary state of chaos before the emergence of a new state of order. Makara is also the emblem of Kamadeva, the god of love and desire. Kamadeva is also known as 'Makara-Ketu' which means "having the makara for an emblem" It is the tenth sign of the Zodiac, called rāśi in Sanskrit, which is equivalent to the zodiacal sign of Capricorn (goat symbol). Row of Makara in base of Chennakesava Temple at Belur, Karnataka. Note Makara standing vertical at corner. 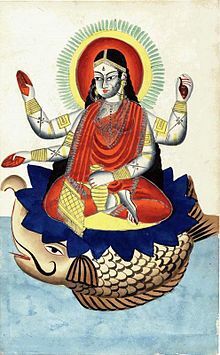 In Hindu iconography, Makara is represented as the vahana ('vehicle') of Ganga, the river goddess. A row of makara may run along the wall of a Hindu temple, act as the hand rail of a staircase, or form an arch above a doorway. The leading Hindu temple architect and builder Ganapati Sthapati describes Makara as a mythical animal with the body of a fish, trunk of an elephant, feet of a lion, eyes of a monkey, ears of a pig, and the tail of a peacock. A more succinct explanation is provided: "An ancient mythological symbol, the hybrid creature is formed from a number of animals such that collectively possess the nature of a crocodile. It has the lower jaw of a crocodile, the snout or trunk of an elephant, the tusks and ears of a wild boar, the darting eyes of a monkey, the scales and the flexible body of a fish, and the swirling tailing feathers of a peacock." Traditionally, a makara is considered to be an aquatic mythical creature. Makara has been depicted typically as half mammal and half fish. Some traditional accounts identify it with a crocodile, specifically Marsh Crocodile because of its etymological roots. It is depicted with the forequarters of an elephant and the hindquarters as a fish tail. Crocodile was also a form which was used in the earlier days which was shown with human body. In many temples, the depiction is in the form of half fish or seal with head of an elephant. It is also shown with head and jaws resembling a crocodile, an elephant trunk with scales of fish and a peacock tail. Other accounts identify it with Gangetic Dolphin having striking resemblances with the latter, now found mainly in Vikramshila Gangetic Dolphin Sanctuary. Others portray it as a fish body with an elephant's head. The tradition identifies the makara with water, the source of all existence and fertility. The Makara Thoranam above the door of the Garbhagriha of Chennakesava Temple at Belur. Two makaras are shown on either end of the arch. In a Hindu temple, the Makara often serves as the structural bookends of a thoranam or archway around a deity. The arch emerges up from the jaws of one Makara, rises to its peak, the Kirtimukha (the 'Face of Glory'), and descends into the gaping jaws of another Makara. Varuna is also depicted as a white man sitting on the monster makara. As a marine monster, it is also shown with the head and legs of an antelope, and the body and tail of a fish. A makara made in iron shows the monster in the form of half stag and half fish. These elements are variously joined to form one of the most common recurring themes in Indian temple iconography. In Indian art, the makara finds expression in the form of many motifs, and has been portrayed in different styles. Makara figures are placed on the entry points (Toranas) of several Buddhist monuments, including the stupa of Sanchi, a world heritage site. It is found guarding the entrances to royal thrones (see Distribution below). In the Tibetan Buddhist format it evolved from the Indian form of makara. However, it is different in some ways such as, "display of lions fore paws, a horse's mane, the gills and tendrils of a fish, and the horns of a deer or dragon. From its once simple fishtail, sometimes feathered, now emerges as a complex spiraling floral pattern known as makara-tail design (Sanskritmakaraketu)". In Tibetan iconography, it is depicted in the Vajrayana as a weapon of strength and tenacity. The Vajrayan weapons which have makara symbolism are; axe, iron hook, curved knife, vajra, and ritual dragon, in all of which the theme is "emergence of the blade from the open mouth of the makara". Its symbolic representation in the form of a makara head at the corner of temple roofs is as water element which also functions as a "rainwater spout or gargoyle". It is also seen as water spouts at the source of a spring. The artistic carving in stone is in the form of identical pair of makaras flanked by two Nāgas (snake gods) along with a crown of Garuda, which is called the kirtimukha face. Such depictions are also seen at the entrance of wooden doorways as the top arch and also as a torana behind Buddha's images. The Newa art of Nepal uses this depiction extensively. In Newar architecture, its depiction is; "as guardian of gateways, the makara image appears on the curved prongs of the vast crossed-vajra that encompasses the four gateways of the two-dimensional mandala. Of the three dimensional-mandala this crossed-vajra supports the whole structure of the mandala palace symbolizing the immovable stability of the vajra-ground on which it stands." The temples of ancient Java is notable with the application of kala-makara as both decorative and symbolic elements of temple architecture. Kala is the giant head, often took place on the top of the entrance with makaras projected on either sides of kala's head flanking the portal or projecting on top corner as antefixes. Kala-makara theme also can be found on stairs railings on either sides. On upper part of stairs, the mouth of kala's head projecting makara downward. The intricate stone carving of twin makaras flanking the lower level of stairs with its bodies forming the stair's railings. These types of stairs decorations can be observed in Borobudur and Prambanan temples. Makara's trunks are often describes as handling gold ornaments or spouting jewels, while in its mouth often projected Gana dwarf figures or animals such as lions or parrots. Makaras are also a characteristic motif of the religious Khmer architecture of the Angkor region of Cambodia which was the capital of the Khmer Empire. Makaras are usually part of the decorative carving on a lintel, tympanum, or wall. Makaras are usually depicted with another symbolic animal, such as a lion, naga or serpent, emerging from its gaping open mouth. Makara are a central design motif in the beautiful lintels of the Roluos group of temples: Preah Ko, Bakong, and Lolei. At Banteay Srei, carvings of makaras disgorging other monsters were installed on many of the buildings' corners. Makara pandol over the image of Lord Buddha in Dambulla cave temple, Sri Lanka. Some cryptozoologists suspect the legend of the Makara may be based in fact, and associate it with the Trunko sighting on South Africa's Indian coast. Some ancient sketches of Makara do tend to resemble modern illustrated renditions of the prehistoric mammal Ambulocetus. A more reasonable identification of the creature is that with the South Asian river dolphin; an animal, which, though now endangered, was once abundantly found in the Ganges-Brahmaputra river system and with which the Makara shares several visible similarities. The makara could also be based on the mugger crocodile or the gharial. Makara is the Sinhala term for dragon, an important figure in Sinhala Buddhist culture in Sri Lanka. It is depicted on toranas in temple architecture and objects of prestige such as in kastanes. Since ancient time, easterners[who?] believe that Makara is one of watery creatures and even from the pre-era of the field of Buddhist art, Makara has been depicted both in work of literature and stone carvings. Makara gained a distinctive position in the Sinhala Buddhist culture - a special place not given in Buddhist artwork in other countries. In Sinhalese ancient artwork Makara has been an invented creature; it is made up of body parts of six or seven animals such as the trunk of the elephant, jaws of the crocodile, ears of the mouse or ape, extruding teeth of wild swine, the tail plume of the peacock and feet of the lion. The Makara is widely used in Sri Lankan Buddhist architecture, often depicted on toranas. The dragon balustrade is another kind of stone carvings which portray the Makara (dragon). These artworks used to decorate the entrance of Buddhist stupas, temples and Bo trees. There are two balustrades at main entrance of Lankatilaka Viharaya in Kandy and they are sometimes called Gajasinha balustrades because of the shape of the Makara there. The guard-stone (Muragala) has given a highest place to Makara. Over the head of the gatekeeper carved in there, the figures of Makara can be seen. Karava Makara flag from Sri Lanka with elephant/fish head and peacock tail. Sinhala-buddhist artists considered Makara as the symbol of posperity and self-sufficiency so they were not hesitant in portraying the sign of Makara in the entrance arch gateway to the religious places, such as temple, stupa or bodi. Precious examples for the above are Temple of the Tooth and Lankatilaka Temple in Kandy. Examples for the arched gateway with Makara over the image of Lord Buddha can be seen in Ridi iharaya and Dambulla cave temple. A figure of Makara has been carved to the handle of a temple key of Gadaladeniya Temple built in 1344 in Diggala in Kandy District. The Makara has also been used as a clan symbol by the Karavas and Karaiyars of Sri Lanka, who both share similar origin and were collectively known as Kurukulam. Since at least 14 century AD, they have used Makara flags in their ceremonies. Clan titles such as Aditya and Varunakulasuriyan were used by them, to indicate their connection to ancient Hindu god Varuna. Stone sculptures of the mythological Makara and its ancient place in the iconography of Hinduism and Buddhism are widely spread throughout South Asia and Southeast Asia. Some researchers, for example Graeme R. Kearsley (Book: Pacal's Portal to Paradise at Palenque) and Stijn van den Hoven have identified many cross pacific relations between the Asian Makara and iconography found in Meso America. With particular mention from Stijn van den Hoven, Izapa Stele 25, the Aztec Calendar Stone and statues in Copan where the double Makara features as skyband. This iconography can also be found on buddhas shoulders. Also on the tomblid of King Pakal this makara sky band symbolism is found. Stijn van den Hoven has written a paper on the subject found on the Academia.edu website. ^ a b c d e Brenda Rosen (3 March 2009). The Mythical Creatures Bible: The Definitive Guide to Legendary Beings. Sterling Publishing Company, Inc. pp. 136–. ISBN 978-1-4027-6536-0. Retrieved 17 January 2011. ^ a b c d e f g Robert Beer (10 September 2003). The handbook of Tibetan Buddhist symbols. Serindia Publications, Inc. pp. 77–. ISBN 978-1-932476-03-3. Retrieved 17 January 2011. ^ George Mason Williams (2003). Handbook of Hindu mythology. ABC-CLIO. pp. 294–. ISBN 978-1-57607-106-9. Retrieved 17 January 2011. ^ a b c Archaeological Institute of America (1970). Archaeology. Archaeological Institute of America. pp. 41–43. Retrieved 17 January 2011. ^ K. Krishna Murthy (October 1985). Mythical animals in Indian art. Abhinav Publications. pp. 37, 41, 44. ISBN 978-0-391-03287-3. Retrieved 17 January 2011. ^ W. J. Wilkins (March 2004). Hindu Mythology, Vedic and Puranic. Kessinger Publishing. pp. 36–. ISBN 978-0-7661-8881-5. Retrieved 17 January 2011. ^ The Asian Civilisations Museum A-Z Guide to its Collections. Singapore: Editions Didier Millet, 2003, p. 300. ^ Clough, B. (1997). Sinhalese English Dictionary. Asian Educational Services. p. 163. ^ Guides, Rough (2015-11-02). The Rough Guide to Sri Lanka. Rough Guides Limited. ISBN 9780241251263. ^ Wijesinghe, Mahil (4 Feb 2007). "Lankatilaka Raja Maha Visharaya - Splendour of the Gampola Era". Sunday Observer. p. 1. Retrieved 16 March 2012. ^ "Discover Sri Lanka". Lanka Nest. Retrieved 16 March 2012. ^ Wijesinghe, Mahil. "Lankatilaka Raja Maha Viharaya - Splendor of the Gampola Ear". Yes. Sunday Observer. Retrieved 16 March 2012. ^ Fernando, Kishani S. "Ridi Viharaya". Daily Mirror. Retrieved 14 March 2012. ^ "Tom Allwood Photography". Tom Allwood. Retrieved 18 March 2012. ^ Kurukshetra. Sri Lak-Indo Study Group. 1976. ^ The Ceylon Antiquary and Literary Register. 1922. ^ Sivasubramaniam, K. (2009). Fisheries in Sri Lanka: anthropological and biological aspects. Kumaran Book House. ISBN 9789556591460. ^ Hoven, Stijn van den. "The Makara, a clear link between Meso American and Asian Vedic cultures". Wikimedia Commons has media related to Makara. Perera, ADTA (Sep–Oct 1975). "Makara - crafted with mattock (ගල් කටුවෙන් පණ ගැන්වූ මකරා)". Religious News (ශාසන ප්‍රවෘත්ති) (in Sinhala). Colombo 7: Religious Division of Department of Cultural Affairs. 5 (1–2): 6–7. Schokman, Derrick (12 April 2003). "The Kusta Raja Gala". Daily News. Retrieved 18 March 2012.